A kippah is a slightly-rounded brimless skullcap worn by many Jewish men while praying, eating, reciting blessings, or studying Jewish religious texts, and at all times by some Jewish men. It is also known as a Yarmulke. In non-Orthodox communities, some women have also begun to wear kippot. Kippot range in size from a small round beanie that covers only the back of the head, to a large, snug cap that covers the whole crown. Tzitzit are special knotted "fringes" or "tassels" found on the four corners of the tallit (Ashkenazi pronunciation: tallis), or prayer shawl. The tallit is worn by Jewish men, and some Jewish women during the prayer service. Customs vary regarding when a Jew begins wearing a tallit. In the Sephardi community, boys wear a tallit from bar mitzvah age. In some Ashkenazi communities it is customary to wear one only after marriage. A tallit katan (small tallit) is a fringed garment worn under the clothing throughout the day. In some Orthodox circles, the fringes are allowed to hang freely outside the clothing. Tefillin known in English as phylacteries (from the Greek word meaning fortress or protection), are two square leather boxes containing biblical verses, attached to the forehead and wound around the left arm by leather straps. They are worn during weekday morning prayer by observant Jewish men. and some Jewish women. A kittel, a white knee-length over garment, is worn by prayer leaders and some observant traditional Jews on the High Holidays. It is traditional for the head of the household to wear a kittel at the Passover Seder, and some grooms wear one under the wedding canopy. 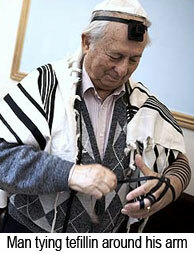 Jewish males are buried in a tallit and sometimes also a kittel which are part of the tachrichim (burial garments). 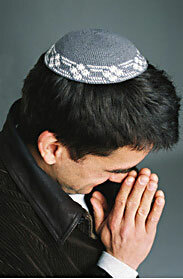 Traditionally, Jews recite prayers three times daily, with a fourth prayer added on Shabbat and holidays. At the heart of each service is the Amidah, or Shemoneh Esrei. Another key prayer in many services is the declaration of faith, the Shema Yisrael (or Shema). The Shema is the recitation of a verse from the Torah (Deuteronomy 6:4): Shema Yisrael Adonai Eloheinu Adonai Echad-"Hear, O Israel! The Lord is our God! The Lord is One!" 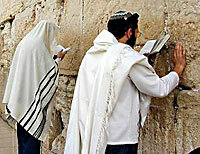 Most of the prayers in a traditional Jewish service can be recited in solitary prayer; although, communal prayer is preferred. Communal prayer requires a quorum of ten adult Jews, called a minyan. In nearly all Orthodox and a few Conservative circles, only male Jews are counted toward a minyan; however, most Conservative Jews and members of other Jewish denominations count female Jews as well. 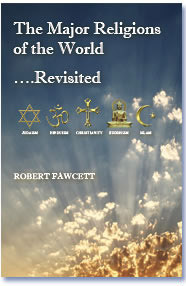 In general, Orthodox and Conservative congregations adhere most closely to tradition, and Reform and Reconstructionist synagogues are more likely to incorporate translations and contemporary writings in their services. Also, in most Conservative synagogues, and all Reform and Reconstructionist congregations, women participate in prayer services on an equal basis with men, including roles traditionally filled only by men, such as reading from the Torah. In addition, many Reform temples use musical accompaniment such as organs and mixed choirs.